Northfield Garage Door Repair | Overhead Garage Door, Inc. When exploring the Village Northfield, IL, one will discover the wide variety of housing styles throughout the Village. These styles range from charming century old properties, to modern condominiums, to the most modern upscale mansions. Overhead Garage Door Inc. is the forefront garage door installation provider in Northfield. Northfield residents trust in Overhead Garage Door Inc. to provide them with an excellent, high quality garage door installation service for their homes. Being a certified dealer of Clopay Garage Doors, Overhead Garage Door Inc. is able to provide its Northfield residents with a wide variety of styles in order to enhance their curb appeal all at an affordable price. The immense amount of styles, colors and designs offered by Overhead Garage Door Inc. allows its customers to customize their garage door so it perfectly matches the feel and style of their Northfield property. Our goal at Overhead Garage Door Inc. is to not only meet your expectations but to exceed them. In addition to assisting our Northfield customers select their custom garage door, Overhead Garage Door Inc. is also an expert at installing and repairing your garage door. Whether you are looking to install a new garage door for your home or to repair a damaged door, Overhead Garage Door Inc. will be there you help you every step of the way. 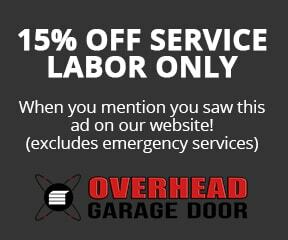 Overhead Garage Door Inc. even offers same day 24 hour emergency services for its Northfield customers. Having a malfunctioning garage door can not only be a stressor on your family but also very dangerous. Don’t wait to fix your garage door. Keep your home secure and safe. Call our experts at Overhead Garage Door Inc. today.